Life experiences count! If you’re lucky enough to have hit the 50+ year mark, you got ‘em. Make funny scenes with other folks who’ve ‘been there.’ Instruction celebrates the creative spirit with humor. You’ll be amazed at the moments you can capture in class. Better than a Polaroid camera. We offer ‘Starter Classes’ for those new to improv and ‘Scenework Classes’ where all you need is a previous hello with a basic improv class or a theater background. Next class is ‘Scenework,’ a four session series. Info/register: 50+ Improvisers: We Make Scenes - May 9, 16, 23, 30. 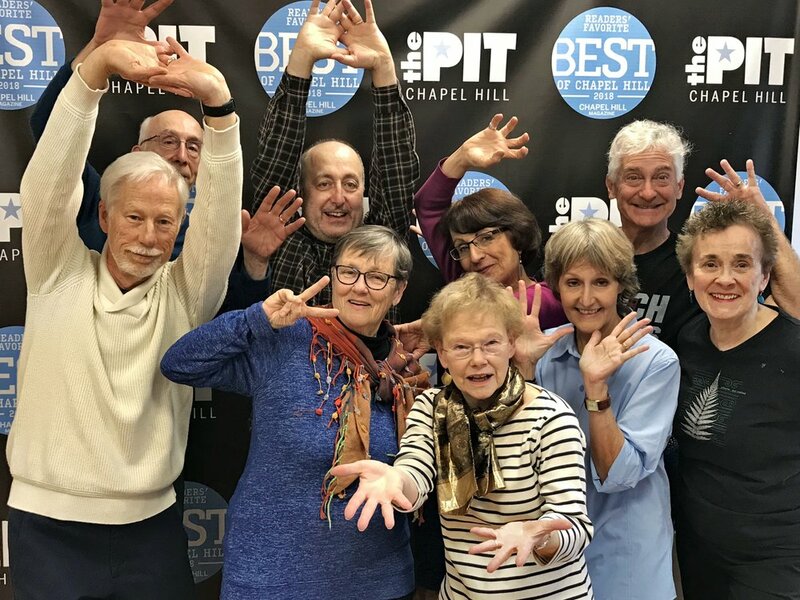 If you’re interested, be sure to let us know here (https://thepit-chapelhill.com/first-to-know-classes) and we’ll give you the first notice of an upcoming class. CAROLYN COLE is an adult educator turned improviser who trained at major theater schools, including The Upright Citizen’s Brigade (UCB/NYC), Second City, and iO in Chicago. She has studied under Susan Messing, Rich Talarico, David Razowsky, and Jimmy Carrane, among others. Improv continues to be a joy for her. "I think a lot about the older improv student since I have many students who are 40+, 50+, 60+, etc. I am an older student myself. My main message is: It’s never too late to put on your improv shoes and begin the journey. You have so much to bring to the stage, so much to gain yourself. And I do believe you will find that improv makes you ageless." Carolyn founded and performs with the ECHOES, an improv troupe that uses trippy, dream logic to deliver a unique theatrical show.